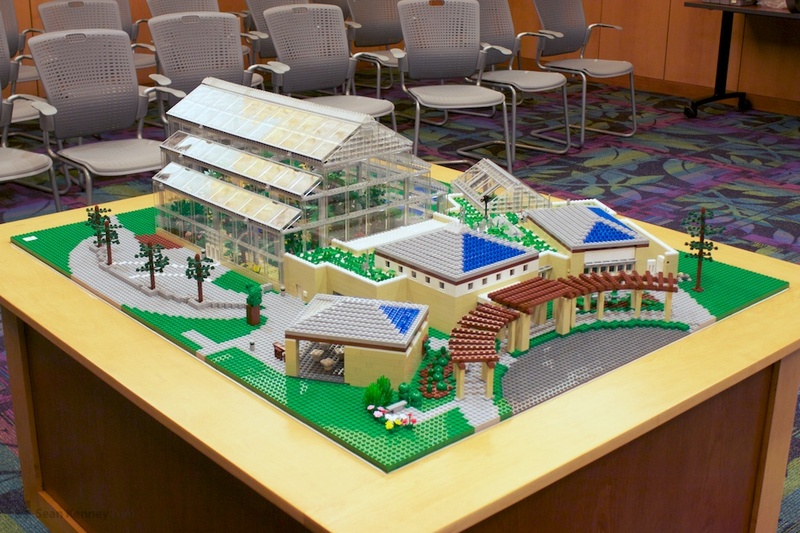 I constructed this scale model of the Nicholas Conservatory in Rockford IL over the course of a three-day public event. The model will remain on permanent public display at the conservatory. The model is about four feet long and contains about 14,500 LEGO pieces. Normally when building scale models, I only need to worry about the exterior, but the giant glass greenhouse conservatory on the back of this building was an interesting challenge... I had to build a completely transparent structure, and the interior too! I usually tuck a "signature brick" like this one somewhere on every one of my models. We spent several weeks looking at floor plans and satellite photos, and then a week building the base layer. Everything was then shipped out to the real conservatory, where I built the buildings, landscaping, and the greenhouse interiors over the course of three days as families and kids came by to watch.